Reasons why you should invest in well-being in the workplace and how to implement it properly. Stress, back pain, anxiety or burnout. You might have experienced or heard of them at some point in your professional career, and it’s a fact that they can clearly burn someone both physically and mentally. Personally, I can’t deny that ditching this well-known 9 to 5 routine would be amazingly beneficial for everyone, but unfortunately —and facing the reality— I am not a travel blogger and my desk is waiting for me every morning. And if you’re reading this, you may well agree with me. According to the latest report on work-related health, safety and illness from the UK National Independent watchdog Health and Safety Executive, the total number of cases of work-related stress, depression or anxiety in 2016/17 was 526,000 — a prevalent rate of 1,610 per 100,000 workers. Stress, depression or anxiety accounted for 40% of all work-related ill health cases and 49% of all working days lost due to ill health. Professional occupations have a statistically significantly higher rate of work-related stress, depression or anxiety than the rate for all occupations. Between 2014 and 2017, the population in professional occupations had 2,010 cases per 100,000 workers, compared with 1,230 cases for all occupational groups. When identifying the stress triggers at work, we can see that there is a clear link between these episodes and the employee’s performance in an organisation. This includes; an increase in productivity, more positive interactions with co-workers, and the ability to focus longer. Needs are always changing, hence working environments are constantly adapting. And there is a growing recognition of the importance of well-being both inside and outside the workplace and most companies are currently implementing these changes with noticeable great results. Going back to my personal experience, I pretty much lead a healthy and active lifestyle. I go to the gym regularly, I practice yoga and pilates, I tend to go for a run over the weekend and I’ve embraced the trendy culture of kale and quinoa after a couple of months trying so hard to pretend I liked the taste. Worth a mention are my homemade ginger shots with turmeric and lemon that burn every single part of my body and my soul. No ginger shot can help with the side-effects of a stressful lifestyle and long hours at work, and that would not shock any fast-paced city dweller like myself —proof positive that I am not alone in this universe. We all struggle. It’s a fact. In the past, I suffered from stress and anxiety after long hours of work and considerable amounts of caffeine in my body, causing a noticeable slump in motivation. Stress, migraines and neck pain being a worn and familiar old shoe —and I emphasize old— I decided to tackle them with some small personal changes instead of tirelessly and endlessly kvetching about it. If you want a change, start by yourself, they say. The positive impact of mindfulness has been in the spotlight more and more over the last few years, and people are looking to not only improve their physical well-being but their mental health, too. Having this in mind, I looked into ways that I could use my lunch break to practice mindfulness and explore alternatives to a sweaty boxing class and reap the same benefits. I was accumulating tension in my neck and back that I couldn’t get rid of at the gym and I tried three different ways to help me feel better: getting a massage on a lunch break, acupuncture and heat treatments. With businesses looking for new ways to help keep their employees well, both mentally and physically, and investing in new benefits and facilities to support a wider range of needs, I spoke to Jack Tang, CEO of Urban Massage, to understand how something as simple as a massage could lead to big improvements in an organisation. A couple of days ago I raised an eyebrow over a startup based in London and it’s innovative and powerful mission to democratize wellness, making it accessible through an easy-to-use app. Astonished by the outcome of this eye-opener experience that I could balance with the cosmopolitan and busy lifestyle that I profess, I decided to drop them a line and —here I am, straight to the point once again— interview the CEO. Next thing I know, I was having a coffee with them. What inspired you to start Urban Massage? I had just sold my first start-up and I was at home, tired. I realised then that even though I could order food to my flat in half an hour and get a cab in two minutes, it took me ages to arrange a massage. The more I dug into the ‘why’, the more I realised how much room there was to do something in this space. By the time my co-founder and I interviewed a few therapist and realised that the therapists got less than half of a cost of a treatment, I knew I wanted to do something disruptive in that market. The mission then was to give people like me the ability to book a treatment quickly, that the therapist would get paid well for and still maintain (or even improve) the little things that make a massage feel so great. From your point of view, what are the most common problems experienced by people in the modern workplace? What I love about living in a city is that it’s full of people with big ambitions and dreams, living life to the fullest, working nights. It’s what we want for ourselves, what it takes to satisfy our dreams. But of course, all of that comes at a cost to how we feel. More and more companies are operating like start-ups with longer working hours, lots of personal responsibility, and this constant connection to our work. Responding to an email on a weekend is now considered pretty normal. It’s no surprise that alongside that workplace burnout is becoming a bigger and bigger focus for employers and people. How is Urban Massage tackling these problems? We don’t want to tell people not to push and work hard. Instead, we want to make it easy and affordable to fit self-care and wellness rituals into their life. Our aim is to make it so there’s no excuse not to. You can’t say you can’t fit a massage into your diary if your therapist arrive at 10.30pm on a Sunday and you booked it an hour before. To begin with, we focused on just that – delivering the best possible experience to someone’s home so it becomes something people feel it’s worth investing in. Increasingly we’re focusing on our corporate offering too, bringing therapists to offices for chair massages. The results so far have been really positive. When talking about the average Urban Massage user, is there any specific or clear target? We cater for all ages and lots of different reasons for wanting a massage – from stress to pain relief, marathon prep to pre and post natal massages. We’re seeing a lot more people in their thirties having regular massages. I think that’s reflective of a general shift towards wellness being something we’re all thinking about, and why we worked hard to find a way to offer a massage for as little as £49 off-peak. We didn’t want to price the younger work-force out of the market. What’s the feedback you receive from companies using Urban Massage services at work? We’re seeing a lot more employers looking for ways to better retain their staff and also take more responsibility for their mental and physical well-being. In terms of feedback, we tend to see the slots get booked out (you can book in advance using our app) in minutes and after the session the most common thing we’ll hear is that it’s a great way to break up a work day — even if it’s only a ten minute chair massage. Around party season we see the number of post-party bookings go up too. A massage definitely beats a coffee for curing a hangover. One of the start-ups who always book fortnightly started off with just one therapist and have upped it to two therapists across two days. And that’s a pretty early stage start-up, prioritising office wellness over say, a beer fridge. I’m all for beer fridges, but I think it’s a positive shift if it’s not the only way we look after our teams. Is there is a growing trend related to organisations investing in employees wellness? According to The Global Wellness Institute, workplace wellness is already a $43 billion industry and like all of the wellness stats, that’s going up. Not to mention all of the investment that’s flooding into the start-ups in this space. On our side, we’re seeing lots more interest in workplace massage, as well as people booking therapists more regularly so it’s not just a one-off treat. WHY SHOULD YOU INVEST IN WELL-BEING IN THE WORKPLACE? Companies like WeWork or Boston Consulting Group (BCG) are currently putting the nail in the coffin for these archaic desk-based routines and leaving space for well-being activities. What is more, WeWork, the well known office-space rental startup, has recently launched a new business inside its network of shared offices. Following their motto “do what you love“, they have been offering fitness classes including; yoga, meditation, dance classes or kickboxing to more than 100,000 members across 140 offices in 13 countries since last year. There is no doubt why they are in the spotlight right now and making a huge difference in the working culture globally. If all this cluster of ideas didn’t click in your brain yet, here are a couple of tips to show you why it’s important and to help you to implement them properly. 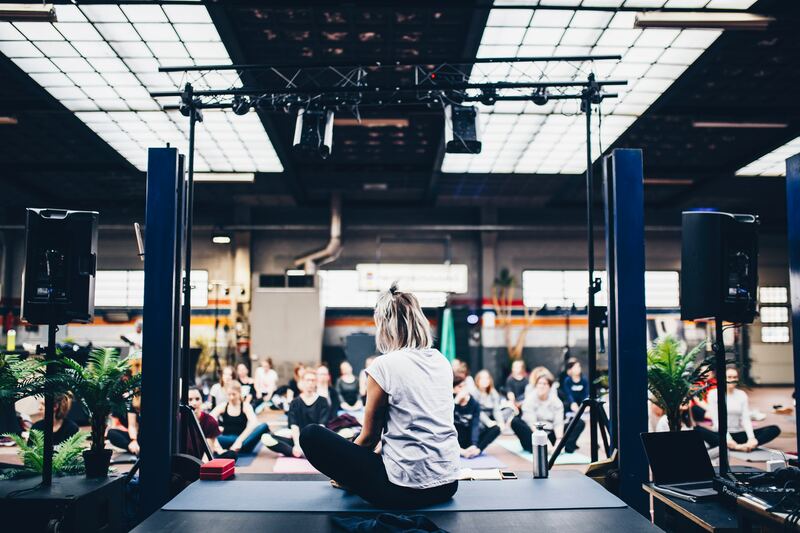 Following mindfulness or yoga premises, being “present in the moment” the employees will be able to control their minds and get a better focus on their current tasks. This is a must-needed skill since multi-tasking is more and more prevalent in every workplace. There are other noticeable changes like improved postures, confidence, energy and a boosted immune system. More than 90 percent of business leaders say that promoting wellness can affect employee productivity and performance, according to survey results from the nonprofit Health Enhancement Research Organisation (HERO). As organisations broaden their business strategies and programs, they will need to expand their focus to include social, spiritual and mental well-being programs. 3) Wellness is not only focused on the physical side but on the mental one too. Don’t focus your programs on physical health only. As I mentioned many times in this article, stress, anxiety and depression can have huge effects on the overall wellness of employees and therefore, a clear and direct impact on productivity, performance and relationships between their work colleagues. Think about it. Your employees will be healthier and happier. And who knows, maybe the sun salutation pose is just exactly what your body was asking all this time. Please, feel free to share your thoughts about well-being in the comments area below, highlight your favourite parts of this post and join the Thrive Global community on Social Media. I can’t wait to hear what you have to say! For more information about Urban Massage, visit their website clicking here.